Simon Dach (29 July 1605 – 15 April 1659) was a Prussian lyrical poet and hymnwriter, born in Memel, Ducal Prussia (now Klaipėda in Lithuania). A hymn writer is someone who writes the text, music or both of hymns. In the Judeo-Christian tradition the composition of hymns dates back to before the time of David who composed many of the Psalms. The term hymnodist, in the USA more than in other regions, broadens the scope to include the study of hymns. Although brought up in humble circumstances (his father was a poorly paid court interpreter in Memel), he received a classical education in the Domschule of Königsberg (now Kaliningrad) and in the Latin schools of Wittenberg and Magdeburg, and entered the University of Königsberg in 1626 where he was a student of theology and philosophy. 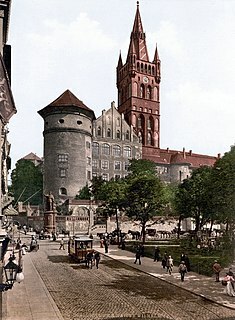 In 1626, he left Magdeburg to escape both the plague and the Thirty Years' War, and returned to his Prussian homeland, settling in Königsberg, where he remained for the rest of his life. Wittenberg, officially Lutherstadt Wittenberg, is a town in Saxony-Anhalt, Germany. Wittenberg is situated on the River Elbe, 60 kilometers (37 mi) north of Leipzig and 90 kilometers (56 mi) south-west of Berlin, and has a population of 48,501 (2008). After earning his degree, Dach was a private tutor for a time, then was appointed Kollaboralor (teacher) in 1633 and co-rector of the Domschule (cathedral school) in Königsberg in 1636. In 1639 he was appointed by Adrian Brauer to the Chair of Poetry at the Albertina University in Königsberg. This was a post he held until his death. Also, in 1640 he received a doctorate from the University. Part of his official duties as Chair of Poetry was to create poems for various University celebrations, programs, debates and funeral services of his colleagues – all of these written either Latin or Greek. In 1644, he wrote the Play Sorbuisa, which celebrated the centennial of the University of Königsberg. Dach became one of the prominent heads of the musical Kürbishütte, a group that included, among others, George Weissel,  Valentin Thilo  and Johann Franck. The summer-house of organist and composer Heinrich Albert became the meeting place of this group of poets, hymnists and musicians, who met in to create new hymns as well as to give readings of their own poetry. This group published eight books of poems and songs from 1638 to 1650, the books meeting with great success. Of the approximately 200 poems and songs contained within the books, Dach had the lion's share, with 125 being his compositions. The songs and hymns contained in these books, especially those of Dach, were sung throughout Germany and frequently appeared in pirated editions. Johann Fran(c)k was a German politician, mayor of Guben and a member of the Landtag of Lower Lusatia, a lyric poet and hymnist. Heinrich Albert was a German composer and poet of the 17th century. He was a member of the Königsberg Poetic Society. As a song composer, he was strongly influenced by Heinrich Schütz. In Königsberg he became friends with and collaborated with Heinrich Albert (1604–1651) and Robert Roberthin  (1600–1648) and with them formed the Königsberger Dichtergruppe  (loosely translated as the "Königsberg Poets' Association"). In 1639 he was appointed professor of poetry at Königsberg through the influence of his friend Roberthin. He sang the praises of the house of the Electors of Brandenburg in a collection of poems entitled Kurbrandenburgische Rose, Adler, Lowe und Scepter (1661), and also produced many occasional poems, several of which became popular; the most famous of them is "Anke von Tharaw öss, de my geföllt" (rendered from Low Saxon by Herder into modern German as "Ännchen von Tharau"), composed in 1637 in honor of the marriage of a friend. Robert Roberthin was a German Baroque poet. He wrote under his own name, as well as the anagram Berrintho. Low German or Low Saxon is a West Germanic language spoken mainly in Northern Germany and the northeastern part of the Netherlands. It is also spoken to a lesser extent in the German diaspora worldwide. Johann GottfriedHerder was a German philosopher, theologian, poet, and literary critic. He is associated with the Enlightenment, Sturm und Drang, and Weimar Classicism. Like Lessing, Goethe and Schleiermacher, in many respects, Herder was a Spinozist. Among Dach's best-known hymns, many of which are still sung, are the following: "Ich bin ja, Herr, in deiner Macht", "Ich bin bei Gott in Gnaden durch Christi Blut und Tod", and "O, wie selig seid ihr doch, ihr Frommen." In all, he wrote over 150 hymns, and a number of poems, and was considered the leading figure of the hymnists and poets of Königsberg. Des Höchsten Ehrendienst ist wegen dein erfreut. Verknüpffen dir sich fest mit einem güldnen Bande. Nicht hie nur, sonder auch im Himmel Hertzog seyn. Conrad Celtes was a German Renaissance humanist scholar and Neo-Latin poet. Joseph Freiherr von Eichendorff was a Prussian poet, novelist, playwright, literary critic, translator, and anthologist. Eichendorff was one of the major writers and critics of Romanticism. Ever since their publication and up to the present day, some of his works have been very popular in Germany. Young Germany was a group of German writers which existed from about 1830 to 1850. It was essentially a youth ideology. Its main proponents were Karl Gutzkow, Heinrich Laube, Theodor Mundt and Ludolf Wienbarg; Heinrich Heine, Ludwig Börne and Georg Büchner were also considered part of the movement. The wider group included Willibald Alexis, Adolf Glassbrenner, Gustav Kühne, Max Waldau and Georg Herwegh. Christian Friedrich Daniel Schubart, was a German poet, organist, composer, and journalist. He was repeatedly punished for his writing and spent ten years in severe conditions in jail. Low Prussian, sometimes known simply as Prussian (Preußisch), is a moribund dialect of East Low German that developed in East Prussia. Low Prussian was spoken in East and West Prussia and Danzig up to 1945. It developed on a Baltic substrate through the influx of Dutch- and Low German-speaking immigrants. It supplanted Old Prussian, which became extinct in the 17th century. Dieter Borchmeyer is a German literary critic. Heinrich Luden was a German historian. Peter Rühmkorf was a German writer who significantly influenced German post-war literature. Michael Kongehl was a German baroque poet. Wolfgang Hilbig was a German author and poet. He was a member of the Socialist Unity Party of Germany. Ludwig Helmbold, also spelled Ludwig Heimbold, was a poet of Lutheran hymns. He is probably best known for his hymn "Nun laßt uns Gott dem Herren", of which J. S. Bach used the fifth stanza for his cantata O heilges Geist- und Wasserbad, BWV 165; Bach also used his words in BWV 73, 79 and 186a. Nasser Garten or Nassengarten was a quarter of Königsberg, Germany, located southwest of the city center. Its territory is now part of the Moskovsky District of Kaliningrad, Russia. Kneiphof Gymnasium was a gymnasium in the Kneiphof quarter of Königsberg, Germany. Andreas Tscherning was a German poet, hymn writer and literary theorist in the tradition of Martin Opitz. Georg Weissel was a German Lutheran minister and hymn writer. Ännchen von Tharau is a 17-stanza poem by the Prussian poet Simon Dach. The namesake of the poem is Anna Neander, the daughter of a parson from Tharau, East Prussia. The poem was written on the occasion of her marriage in 1636 and had been set to music as a song by 1642. August Buchner was a German philologist, poet and literary scholar, an influential professor of poetry and rhetoric at the University of Wittenberg. ↑ Königsberger Dichtergruppe Archived 28 September 2007 at the Wayback Machine . This article incorporates text from a publication now in the public domain : Chisholm, Hugh, ed. (1911). "Dach, Simon". Encyclopædia Britannica (11th ed.). Cambridge University Press. Alexander J. Birt: Simon Dach. Gräfe & Unzer, Königsberg i.P. 1905. Bruno Nick: Das Naturgefühl bei Simon Dach. - Greifswald, Univ. Diss., 1911. August Gebauer (Hrsg. ): Simon Dach und seine Freunde als Kirchenlieddichter. Osiander, Tübingen 1828. Heinrich Stiehler: Simon Dach. Hartung, Königsberg i.P., 1896. Hermann Österley: Simon Dach; Tübingen 1876. Barbara Sturzenegger: Simon Dach und Paul Fleming: Topoi der Freundschaft im 17. Jahrhundert. Diss. Bern 1996. Axel E. Walter (Hrsg. ), Simon Dach (1605-1659). Berlin, de Gruyter, 2008. Friedrich Wilhelm Bautz (1975). "Dach, Simon". In Bautz, Friedrich Wilhelm. Biographisch-Bibliographisches Kirchenlexikon (BBKL) (in German). 1. Hamm: Bautz. cols. 1189–1191. ISBN 3-88309-013-1.